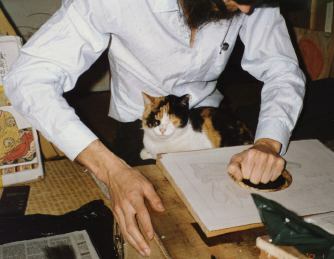 It is impossible for anyone to learn very much about a traditional craft like woodblock printmaking without contact and communication with people working in the field. Luckily for me, there are printmakers around who are not only willing to share their experiences and secrets with me, but are eager to do so. Our guest craftsman this issue is one of them, someone very special for me. We are going to meet a man who has acted as one of my 'teachers' over the past couple of years. You'll also find the regular features - the customer profile, the continuing saga of how I got started in this, and oh yes, I've got a bit of egg to wipe off my face. Now I hope that doesn't become a regular feature! I was so pleased with the way that Tenji Tenno turned out that I immediately made plans for making another print from Shunsho's book, putting in an order with Shimano-san for some more woodblocks, and starting to prepare the tracing to guide the carving. This would be more difficult this time. The source that I had used for making the first print was that full-page illustration in the Heibonsha book 'Karuta', but as no other pictures in the book were 'large size', I would have to find a different method. The only solution, it seemed to me, was to head down to the Toyo Bunko again and see if they would permit me to photograph the original book. I didn't have much hope that they would. They had certainly been friendly enough when I wanted to look at it, but I couldn't imagine them allowing reproduction. When Michiyo and I got down there one morning that week, the place was closed. They had changed their hours with the new year, and my old pamphlet had led me astray. Two hours getting there, and two back .... Michiyo wasn't about to take it lying down. We could see lights on in some of the rooms, so she banged on a door, gave our sob story to the guard, and got us in! Koyama-san was working in the reading room upstairs. We apologized for disturbing him and hesitantly asked about reproductions from the book. I needn't have been so pessimistic - he smiled and pushed a standard 'Request for Reproduction' form across the counter. There was going to be no problem! I ordered 'bromide' photographs of the first 10 pages of the book. Why 10 pages? Why the first ten pages? I'm not really sure. My first impulse had been to order the whole thing. I liked it so much, I wanted to have the entire set for study. Perhaps it was the little bit of arithmetic on my fingers, or maybe it was something in Michiyo's eyes when she finished the sum on her mental abacus, that told me I had better reduce it to a relatively inexpensive 10. As for which 10, it didn't really matter. I hadn't spent enough time with the book at this point to have chosen any favorites. I just wanted to get involved with it. 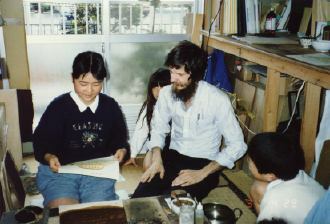 What followed immediately of course, was 18 English classes per week starting up for the new term. Surely, those blocks from Shimano-san would be here any day now ... wouldn't they? This little series has so far profiled a couple of local business people, a company president, and a foreign university teacher. What other kind of people are interested in my prints? How about Tomoko Kawanaka, a grade six student from Saitama Prefecture! 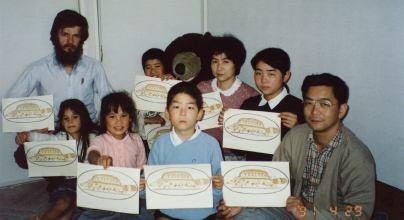 I first came in touch with Tomoko when she sent me a New Year's card for 1990. Her family had been subscribers to my print series for the previous few months, and had just received the print of the blind poet Semi Maru. Tomoko was puzzled as to why he was depicted bare-headed, when all other illustrations she had seen showed him with some kind of head covering. I answered her as best I could (mmmmm ... I don't know ... mmmmm), and we corresponded further. She sent a print she had made in school, and I sent some other prints I had made a few years ago. She is not only interested in printmaking, and of course is busy with schoolwork, but also cooks, plays violin, and rides a mean unicycle! During Golden Week this year, Tomoko and her family dropped by for a day, and we got to know one another a bit better. We all had fun playing with my collection of wooden puzzles and games, and then taking turns making prints from some of my woodblocks. I think that everybody (Mom and Dad included) was surprised to find how easy it was to make good looking prints! I get just as much pleasure out of a day like this as I do from making my own prints. If through my efforts, I can get more people hooked on this interesting, enjoyable, creative, fascinating, relaxing, delightful and gratifying work, then I am happy. Next year Tomoko will become a very busy middle school student, but I hope that she will continue print making, and that when she grows up and perhaps has a family of her own, it will remain part of her life. Thank you Tomoko, and I'm waiting to see that next print! The sound is what first catches your attention as you are climbing the narrow stairs to the workroom. A vigorous swirling, brushing sound (is somebody cleaning his shoes?) .... a slight rustle of paper .... a pause, and then another vigorous sound, this time a scratchy kind of rubbing .... another pause, another rustle of paper. What are these people doing? Of course, they are making woodblock prints - rubbing brushes over woodblocks, and barens over sheets of paper, the sequence repeated anew every few seconds as they work their way down the stacks of paper. 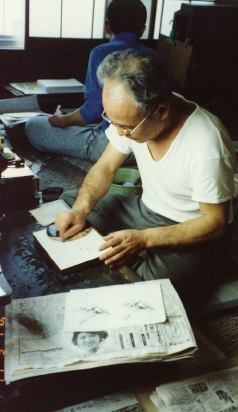 Master printer Mr. Keizaburo Matsuzaki and his son Hiroshige are at work in their home in Tokyo's shitamachi district. On this particular visit, one of many I have made to this room, the windows are closed to keep out the winter cold, muting the traffic noise and leaving the soft sounds of the printmaking work clearly audible. They are as familiar to Matsuzaki-san as his own heartbeat and breathing, for he has been hearing them now for 39 years, ever since taking his place at an apprentice's bench at 15. 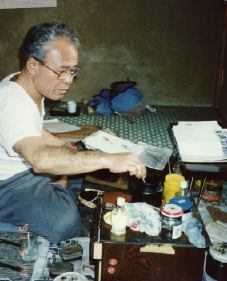 In the heyday of Ukiyo-e printmaking, men like Matsuzaki-san were common. Hundreds of printers lived in these streets, turning out stack after stack of the beautiful prints that now grace museums around the world. The highly critical eyes of the public, the demands of the publishers, and the ever increasing technical challenges put forward by the designers, all combined to push these men to ever higher standards of achievement. They were, and remain now, fiercely proud of their abilities. All their skills and resources were called for with each job. Matsuzaki-san, to your willingness to help me, I owe everything. The words 'thank you very much' do not even come close. "Thank you for the 'Hyaku-nin Issho' newsletters ... Reading them makes me think of feelings that are not so often expressed nowadays ... I have to mention something that I noticed when I studied those photographs in the first issue that compare your print with the original. Looking at the shape of the characters in the poem, I think that you have captured well the variations in the 'strength' of the brush strokes. However, there is one place, in the fifth large character from the top, where you interpreted the character 'this' way, and I think that perhaps it should be 'this' way (he draws examples) ... "
When I read this letter I was astounded. I ran to my shelf, and dragged down my copy of the Kinto print, along with the enlarged photo that I used when I made the transfer sheet for carving. I didn't need a magnifying glass to see that he was right! I had completely misunderstood the direction of the brush stroke at that point. Usually when I sit down to carve each of the poems, I try to come to some kind of understanding of the direction and order of the strokes in each character before I start cutting. There is no way that kanji characters can be carved correctly without such comprehension. 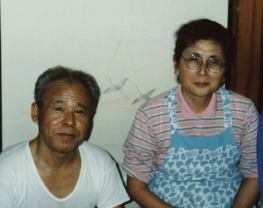 If I have problems, I consult with either Michiyo or Ashida-san, the lady running my packaging and shipping 'department'. Obviously, when I was cutting this particular character, I felt that I had it 'figured out', and didn't ask for advice. Oops. Michiyo and I had a good laugh as we sat and looked at it. Of all the possible choices of prints to illustrate when putting that newsletter together, I had to choose that one .... I have written before about the mistakes that I have found at various places in the original book, and now it's my turn! Please don't think that I am upset at Mr. Kamei for pointing this out. 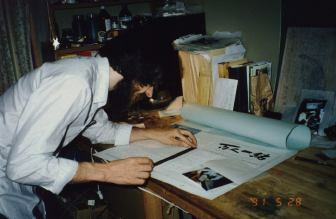 His letter also included many kind comments about my work, and I am very glad that he is studying the prints so closely, and that he wrote to me about this. Most viewers of my prints are quite effusive in their praise - wonderful for my ego, but doing nothing for the improvement of my skills. The only possible way for me to ever get any better, is through study of my bad points. So let's get with it out there. Of course, I love to hear your praise. But please do me a favour, and next time you write, don't hesitate to tell me where you think the prints can be improved. I may or may not agree with what you say, but I will certainly listen. You'd better believe that I was thinking of Mr. Kamei's comments when I started carving the next poem! I guess that should about wrap it up for this time. I'm really enjoying putting this little newsletter togther, and am glad I started doing it. We're pretty 'low-tech' here - not exactly 'Desk Top Publishing' - more like 'Do It Yourself Publishing'. We hope that you find our work worthwhile and interesting, and we would love to get to meet more of you face to face. Come and see us sometime. Who knows, you might get your picture in the paper!